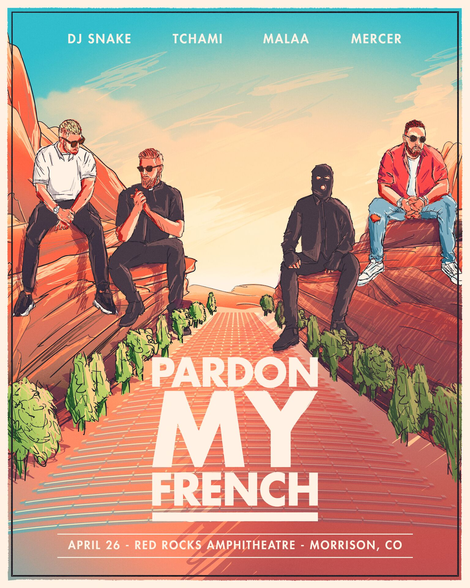 Pardon My French - a collective of French DJ/producers DJ Snake, Tchami, Malaa and Mercer - join together for the first time since 2016 at the Red Rocks Amphitheatre in Morrison, Colorado on 26 April. The amphitheatre is apparently a geological phenomenon – the only naturally-occurring, acoustically perfect amphitheatre in the world. In over 75 years as a performance venue, it has hosted some of the most significant artists in music ranging from The Beatles, Jimi Hendrix and The Grateful Dead to Radiohead and Daft Punk, among many others. The 26 April Pardon My French Red Rocks event will be highlighted by full live sets from DJ Snake, Tchami x Malaa and Mercer, custom production and a backdrop that’s arguably unlike anything else in the world. Pardon My French was created in 2015 with the aim of bringing French electronic music artists together to share their their vision and passion for music with the world.